In the wake of South Carolina's historic rainfall event in October 2015, fishermen and biologists were unsure how the unprecedented influx of freshwater would impact the state’s shrimp fishery. Now, local shrimp are back on the menu–and contrary to early concerns, S.C. Department of Natural Resources (DNR) biologists are expecting a productive year, with models predicting the largest roe white shrimp crop since 1979. The commercial shrimp trawling season will open in all state waters where trawling is legal at 8 a.m. on Monday, May 16. Shrimp season normally opens in mid- to late-May, after the peak spawning period of white shrimp has occurred. Eight smaller provisional areas opened in early April. "This opening is a little earlier than average, but given the progression of key factors this year and in particular the high forecast for roe white shrimp, we wanted to let the fleet get to work as soon as possible,” said Mel Bell, director of DNR’s Office of Fisheries Management. Several key factors have contributed to 2016’s record shrimp stocks, according to DNR biologists. Like the rest of the continental United States, South Carolina experienced an unseasonably warm winter, which the National Oceanic and Atmospheric Administration confirmed as the country’s warmest on record. 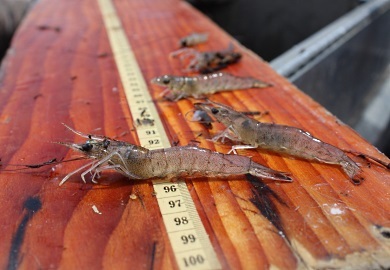 The higher water temperatures afforded shrimp an extended growing season, but they may also have delayed the dieback of black gill syndrome, a condition that weakens shrimp and whose spread is normally curbed in winter. In addition to the warm winter, the high volumes of freshwater and nutrients carried downstream by the fall flood may have had some unexpected impacts on South Carolina’s shrimp. “Shrimp respond well to a large influx of nutrients, which increases growth rates,” said DNR marine scientist Amy Fowler. Researchers have documented similar impacts on shrimp in places such as Louisiana and Texas. “Low salinity also flushes predators such as red drum and spotted seatrout,” she said, making it possible that South Carolina’s shrimp faced less predation in the months following the flood, when the influx of floodwaters dramatically lowered salinity levels along the coast. Three peak periods define the state's commercial shrimp fishery calendar. The roe white shrimp season will open 8 a.m., May 16 in state waters where trawling is permitted. The roe white shrimp season generates the most value for fishing effort, with relatively high early season prices for large roe shrimp. The second period, the brown shrimp season, typically peaks during the summer months. The third period of shrimp season consists of the offspring of the spring white shrimp crop, which peaks in the fall and ends in winter. DNR monitors South Carolina’s shrimp fisheries in a number of ways, relying on data collected by DNR biologists during sampling trips aboard both commercial and agency vessels to form the most accurate picture of the state’s shrimp populations. Before the season can open to commercial trawling, biologists look for evidence that a majority of female white shrimp have spawned. “There will be plenty of high-quality, wild-caught local shrimp in South Carolina this summer, and we encourage people to support the industry by buying local,” said Bell. Shrimpers suggest buying in bulk early in the season and freezing leftover shrimp. The total shrimp harvest in 2015 reached over two million pounds (measured heads-off), with a dockside value of more than $8.5 million.